Exmoor produces delicious food. Whether you are looking for an interesting selection of places to eat, with local produce often featured, or whether you are planning to prepare either your own special meal or even a simple picnic, you will be well pleased with what you find. Locally produced meat is widely available. The higher moor produces succulent lamb and the more sheltered pastures provide excellent beef. You can also find organic meat and other produce. You may well have tasted our thick golden clotted cream with our famous cream teas, but you may not have tasted some of our local cheeses - in which case that's a pleasure still to come. Other small local producers on, and close to Exmoor offer fish, smoked foods, eggs, excellent bread, jams, venison and other game, and more - there are two local breweries and even an Exmoor vineyard! You can buy from the producer directly, at farmers markets or in local shops such as award winning butchers, bakers, delicatessens, etc. 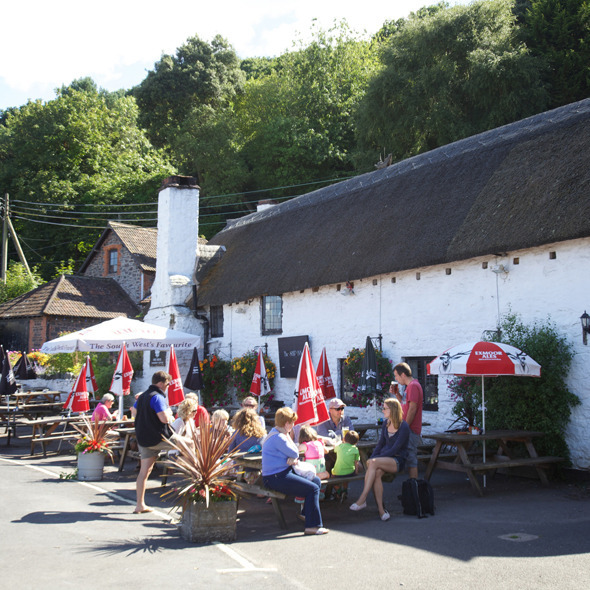 Most local hostelries and hotels pride themselves on their use of local products and even if you are self-catering, you don't need to bring your supermarket bags with you when you come to Exmoor! For everything from a quick lunchtime snack, a cream tea, a hearty pub supper or a more elegant dinner, you can make your own choice from a good range of possibilities.